You’ll start your luxury trip in Hanoi, Vietnam's artistic and intellectual capital, which celebrated its 1,000 year anniversary in 2010. Historical emphasis on the arts and learning stipulates that buildings in Hanoi remain small, simple and in harmony with nature. You will be met at the airport and escorted to your hotel where you will have free time before a welcome dinner at a local restaurant and an overnight stay. You will visit the Ho Chi Minh Mausoleum, where the preserved body of "Uncle Ho" may be viewed. You’ll also see his nearby house, the lotus-shaped One Pillar Pagoda, Quan Thanh Temple, the Temple of Literature, Hoan Kiem Lake, Ngoc Son Temple, and other museums. Following lunch at a local restaurant, you’ll enjoy a one-hour cyclo ride around the Hanoi Old Quarter and enjoy a traditional Vietnamese water Halong Bay, Vietnam tours puppet show. You will be driven to Ha Long Bay, which is one of the most magnificent scenic spots in all of Vietnam and was designated by UNESCO as a World Natural Heritage Site in 1994. It is a picturesque bay with some 775 islets rising from the clear emerald waters of the Gulf of Tonkin. Washed by water and lapped by waves for hundreds of thousands of years, the limestone basin has been carved into stalactite-filled caves, crescent beaches and odd-shaped formations. You will stay overnight in Hanoi. Today you will take a flight to Hue, Vietnam’s former imperial capital, which sits on the Perfume River. On arrival in Hue you will transfer to your hotel. In Hue City Tourthe afternoon, you will visit the imposing Imperial Citadel, the Museum of Royal Relics and the Dong Ba market. Enjoy a cyclo ride this evening to the restaurant where you will enjoy a Hue royal-style dinner before an overnight stay in Hue. You’ll continue your sightseeing in mystical Hue today, including a boat trip on the Perfume River to Thien Mu Pagoda. Next, you’ll drive to visit some of the thirteen lavish imperial tombs of the Nguyen kings, including King Tu Ducs tomb and King Khai Dinh's tomb, followed by lunch at a local restaurant. This afternoon, you’ll drive south to Danang through the inspiring 4,900 foot high Hai Van Pass, Vietnam's geographical and psychological boundary between north and south. The peak of the pass lies perpetually shrouded in clouds. You will stop at the stone-carving village at the foot of the Marble Mountains and continue to the absolutely charming and relaxed town of Hoi An. Believed to have been settled no less than 2,200 years ago, Hoi An was a thriving seaport and a base Hoian Tour, Cooking Class Tourfor seafaring nations seeking new sources of wealth throughout Southeast Asia. Even ancient Arab trading documents mention Hoi An as a stop along their trade routes. Upon arrival, you’ll check into your hotel for an overnight stay in Hoi An. After breakfast at the hotel, you’ll pay a visit to a family-run lantern-making business, where you will get a chance to design your own lantern with the assistance of your native hosts and take it with you as a souvenir. You will continue exploring the narrow streets of Hoi An, which are lined with buildings representing a mix of architectural styles, some of which are not seen anywhere else today. Some of the highlights include the temples of Phuoc Kien and Quang Dong and a 16th Century Japanese covered bridge. You will have lunch at a local restaurant and have the rest of the day free before an overnight stay in Hoi An. After a morning drive to Danang, you will visit the Cham Museum, featuring artifacts from the Kingdom of Champa, a civilization that ruled the area from the 2nd to the 14th Century. 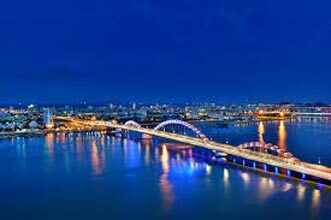 Later, you’ll fly to vibrant Ho Chi Minh City (formerly Saigon) and check into your hotel. Although it's the largest and busiest city in Vietnam, Ho Chi Minh City retains the beauty of its graceful colonial French-style structures. You will stay overnight in HCMC. In the morning you will drive to visit the Cu Chi tunnels. You will explore the "Iron Triangle", riddled with an extensive system of tunnels used during the American War, along with fascinating traps and surprises. 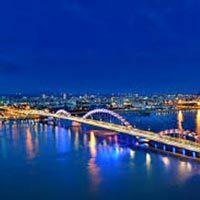 Enjoy your lunch at a well-known local restaurant before continuing the tour in the afternoon and visiting the former Presidential Palace, the Cathedral, the Central Post Office and Ben Thanh Market. You will stay overnight in HCMC. In the morning, you’ll fly to Siem Riep in northern Cambodia to visit the fabulous ancient sites of Angkor, one of the great wonders of world. The grandeur of this bygone civilization is truly astounding. You will visit Angkor Thom (or "Great City") which is in some ways even more spectacular than the colossal Angkor Wat, as it has nearly disappeared into the jungle. You will be met and transferred to your comfortable hotel for check in (subject to room availability). The tour will take you to Angkor Wat, a World Heritage Site since 1992, famous for its beauty and splendor. Angkor Wat features the longest continuous bas-relief in the world, which runs along the outer gallery walls and narrates stories from Hindu mythology. After that, you can visit Bakheng Temple and enjoy a romantic sunset view form Bakheng Hill before an overnight stay in Siem Reap. You will embark on an elephant ride from the South Gate of Angkor Thom through the jungle to the famous Bayon temple, unique for its 54 towers decorated with over 200 smiling faces of Avolokitesvara, Baphoun. You will also see the Elephant Terrace and the Terrace of the Leper King. In the afternoon you will continue to visit fabulous Ta Prohm (embraced by the roots of enormous fig trees and gigantic creepers), Pre Rup, East Mebon, Krovan, Srah Srang, Banteay Kdei and Ta Keo. You will have dinner while enjoying a performance of Apsara (Khmer folk dancing) before an overnight stay in Siem Reap. You will board a boat on Tonle Sap Lake and enjoy a brief cruise past floating villages complete with schools, restaurants, hospitals, and the school known as "Les Artisans d'Angkor." You will then transfer to Siem Reap International Airport for your departing flight.